the distance till Thanksgiving (hopefully). and gourds that I purchased at my local farmer's market. in its own decay juice...a gross clean up AND $14 down the drain. internet for ways to keep these fruits of Fall last longer. tips plus a few (retrospective) ideas from me. our flesh and other organs and "holds everything together". In the following text I am going to write "pumpkin" but the same ideas relate to gourds too. the pumpkin already has started rotting internally. these issues will mean that the pumpkin will not last very long. skin can recover from cuts but a pumpkin's cannot. it has made the trip from the field to the market unscathed. their moment of decorating glory. holds true for a pumpkin's skin too...keep it clean. 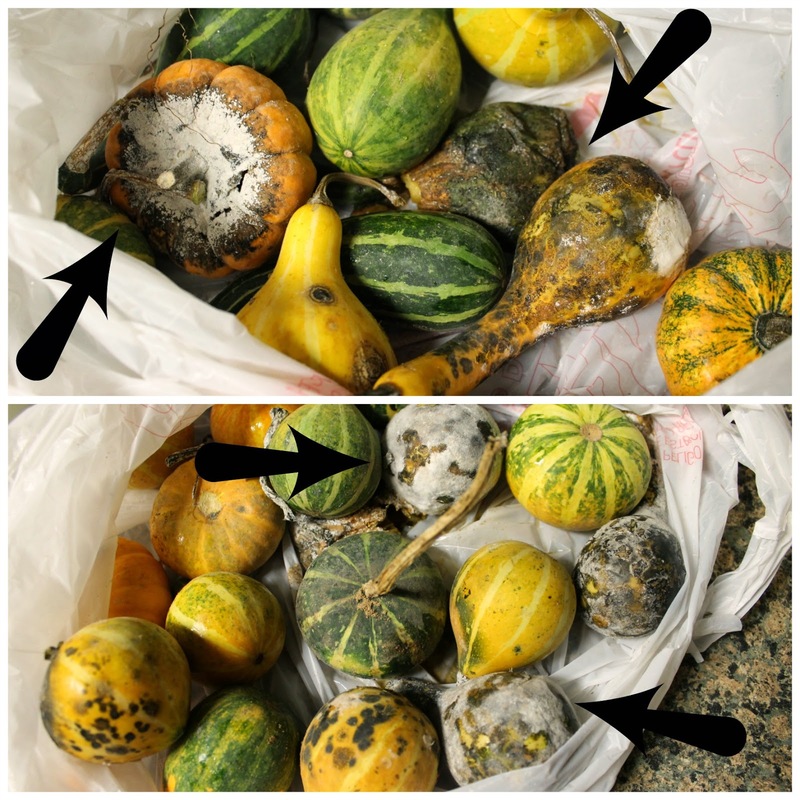 Wash the pumpkins with an all purpose and/or disinfectant cleaner. you to recheck the pumpkins for possible problems areas to watch. 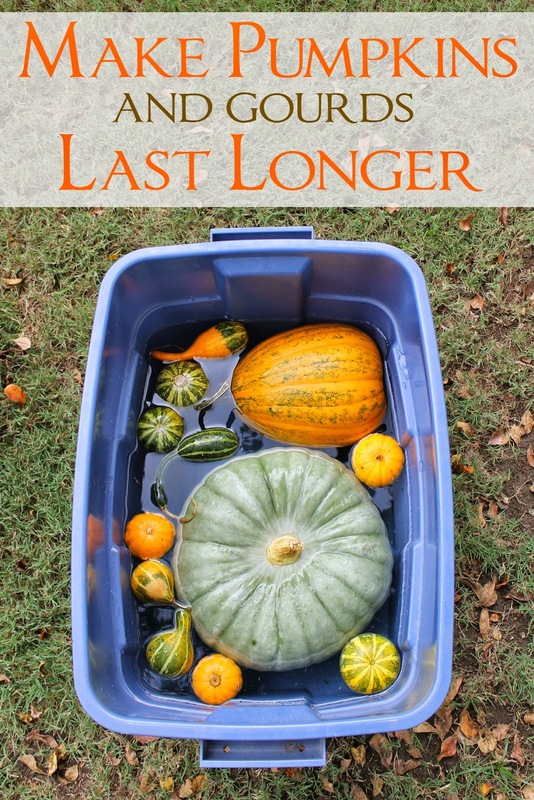 the next important step in prolonging the life of your pumpkin. but it seems no harm done. I rotated them about 15 minutes each side (not exact but about). For large pumpkins you may need to rotate and flip. solution sitting on the pumpkin could be a negative. let them come in the house to dry out on a beach towel. plastic bags that I left them in. and pumpkins and protect them from life-shortening mold. that it embodied the colors of my Fall decorating this year. after one-too-many drinks...bless her heart. Above that pumpkin are more survivors. Sometimes the top of the pumpkin is the most interesting part. Try turning the pumpkin on its side so folks can see it. with two not-so-real pumpkins and vines from the woods. have to worry about mold destroying them either. also on their sides along with a metal angel. pumpkin was just too interesting to not display. the stem even (and maybe allow infection to start) so I glued it on. The glue was not drying very fast and I got impatient holding it. I devised a twine holder to keep it steady while the glue dried. the large candlesticks since the "painting" is large. A chubbier gourd sits amoung the gathered deer antlers. will last all the way through Thanksgiving inside the house. water/bleach solution to inhibit mold with good results. outside in the yard only cost about $5 each at the grocery store. them out. They will just have to hope for the best. simulate pumpkin vines and added the store-bought pumpkins. look like they will make it to Halloween for sure. Hope these tips make your pumpkins go the distance too! Gayle I just lost a $16 pumpkin and I only had it for about 2 weeks...mine too got a dig on the car ride home and that's where it started to rot! LOVE LOVE LOVE the displays on your bookshelves...so pretty!! Love your decor with all pumpkins, very pretty. Gayle, Thanks for sharing this info. I can't tell you how many pumpkins I have bought that rotted almost right away. They look wonderful displayed in your bookcases and I love the pumpkin patch. first of all, your displays are so gorgeous, both inside and out. second, i hope your non-coddled pumpkins last until thanksgiving, too. i just had to throw all my little ones on the stairs out. i wiped them all over with vasoline to keep the squirrels away, which has worked since early september, but i realized that they were all moldy now. i got a good month out of them, at least. enjoy yours!